It's been quite a while since I last saw a Parallel 49 beer in a bigger, seasonal release bottle - so it's nice to see their beer selection increasing here in Manitoba! Tonight I'm checking out their Mystic Skull #5. 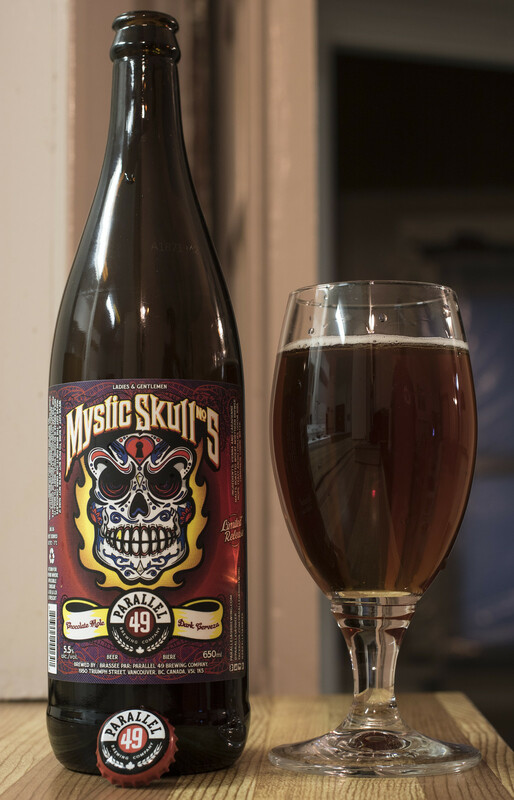 Mystic Skull #5 is described as being a dark lager inspired by the Vienna Lagers brewed in Mexico, Mystic Skull No. 5 is light and crisp with bready, toasty malt flavour. Brewing this beer with traditional ingredients used in mole sauce give this cerveza its aromas of chili spice, cumin, cinnamon and chocolate. Appearance: Mystic Skull pours a bright amber caramel red lager with a light amount of carbonation, a light amount of beige head on top but starts off with a whole finger's worth of head when pouring into the glass but diminishes into a light amount of head around the edge of the glass almost immediately. Aroma: So when I was smelling from the bottle, I seriously couldn't smell anything. Once I poured it into the glass some of the scents finally popped out. I got a bit of a smell of caramel, raisins and wet paper. The malt aroma is sharp and not really enjoying it - I can't pinpoint exactly what I'm smelling. Some are saying it's the cumin but I'm not familiar with the spice so I'm not sure what it is. It almost reminds me of an oxidized amber ale. Taste: Starts out with the taste of tortilla chips (without the salt), followed by a hint of saltiness (oddly enough), a hint of caramel malt and again, a bit of a wet paper taste in there. It's comparing itself to being inspired a bit by Mexican hot chocolate but this tastes nothing like Mexican hot chocolate. The only thing I'm actually liking about this beer is that there's an interesting spice presence (likely from the cumin) that warm up the back of my mouth ever so slightly. Not noticing even the faintest hint of chili spice, cinnamon or chocolate. Overall Thoughts: Sure not worth $6.00 + taxes. There was a weird sharp taste in there that just rubbed me the wrong way. Not only that, I kept getting the taste of wet paper which shouldn't be happening.. I can't see this beer being in the MLCC warehouses for several months next to a radiator or anything. The reviews over at RateBeer.com seem to be agreeing with me. Maybe there's something I'm just missing in this beer? Let me know.